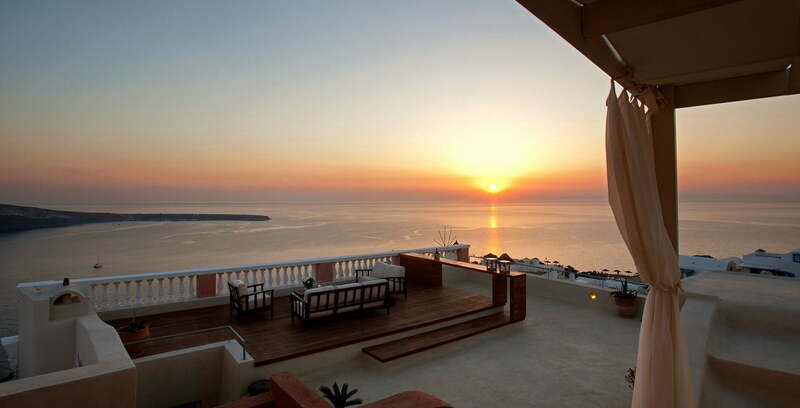 Sunset Villa is a luxurious 4-bedroom villa in Oia Santorini with a total surface of approximate four hundred square meters. Situated on the highest point of the village it offers unobstructed bird’s eye views of the Caldera, the spectacular Oia sunset and the surrounding Aegean islands. Recently renovated to 5-star hospitality standards it meets the rising expectations of our distinguished guests and simultaneously it retains its original neoclassical character and glory. Vast spaces, wooden floors, vaulted ceilings and carefully picked antique furniture create a unique atmosphere with an intriguing mix of scents from the past and contemporary comfort and luxury. The outdoors, extended in several levels, offers the guests various options for lounging, dining and, most of all, enjoying the stunning views. The spacious pebble-paved yard with the wooden dining table, the private balcony, the large terrace and of course the outdoor shaded Jacuzzi are some of this villa’s prime “sunset settings”. To secure this reservation, upon confirmation of the booking & not later than three banking days a 50% deposit of the total accommodation cost is required. The remaining balance % is due 20 days prior to arrival. We reserve the right to preauthorize credit cards prior to your arrival. In case of a no-show or an earlier departure the full fee will be charged. From the 1st of October to the 31st of May, cancellations made up to 14 days prior to arrival are free of charge. For cancellations made 13 days or less prior to arrival there is a charge and 50% of the total accommodation cost. From the 1st of June to 30th of September, cancellations made up to 21 days prior to arrival are free of charge. For cancellations made 20 days or less prior to arrival there is a charge and 50% of the total accommodation cost. Living room, dining room (seats up to 10 people), office, fully equipped state of the art kitchen, sky lighted Internal patio & external pebble - paved yard.